The vast archipelago and the great number of islands have made Indonesia the home of large variety of plant life. The Indonesia flora ranges from the tiny orchid to the giant rafflesia plant. No wonder many botanists are curious to study these plants. 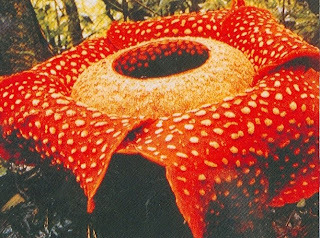 The rafflesia arnoldi is the biggest flower in the world. It is unusual because of its large size. It has a flower almost a meter in diameter and 1.40 meters in height. "Rafflesia" is derived from the name of the British Governor General, Sir Thomas Stamford Rafflesia, who once governed and built the Botanical Gardens in Bogor. Though it is called Rafflesia after Raffles, the man who discovered the plant was Beccary, an Italian botanist who visited Sumatera in 1928. Rafflesia consist of two parts: the stick-like part which grows in the middle and the petals around and below it. The Rafflesia plant begins two flower in its tenth year. It blooms three or four times a year. Before it begins to flower, the leaves and the steam become dry and look dead, but the main root in the ground is still alive. While the flower is blossoming, it has a very unpleasant smell which attracs insect, especially green flies. They seen eagger to explore the flower. But it flies touch the bottom part of the stick, they will die.